Varsity Wrestling Saturday January 3rd, 2015 08:30 AM Place 26 Points 52 Final Broncos Place Points 26 52 Opponents Brownsburg High School Place Points 1 261 Zionsville Com High School Place Points 2 195 Meet Recap The Broncos finished 26th in the 32 team tournament . Corbin Maddox was the top finisher placing 5th. The DCAA wrestling tourney at Wes-Del is still on tonight with a 5:00 pm start time. We wish all of our Bronco wrestlers good luck this evening. Go Broncos! Our Varsity wrestlers will be competing Saturday at Wapahani for the Raider Rumble. Starts at 9:00a.m. Coach Duke, Coach Corn, and Coach Webb are doing a fantastic job leading our team. Show your Bronco Spirit and cheer on our wrestlers tomorrow! Varsity Wrestling Monday December 15th, 2014 07:00 PM Monroe Central High School Away 60 @ Broncos Home 18 Meet Recap Jonathan Drown ,Corbin Maddox , Andrew Ingenito , Connor Clark were winners against Monroe Central .The Broncos wrestle Saturday at the Raider Rumble. 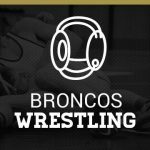 Varsity Wrestling Wednesday December 3rd, 2014 06:00 PM Mt Vernon High School Away 57 @ Broncos Home 21 Meet Recap Chris Kinnick, Jonathan Drown, Corbin Maddox, and Connor Clark were winners for the Broncos.Daleville wrestles Monroe Central December 16 at home. HS boys wrestling season kicks off Saturday, November 22nd at 9:00a.m. We are excited to once again host the Bronco Super Duals. Schools/Teams that are participating are: Daleville, Blue River, Monroe Central, Lakeland, Wapahani, & Northeastern Admission: $5.00 (Auxiliary Gym) GO BRONCOS!